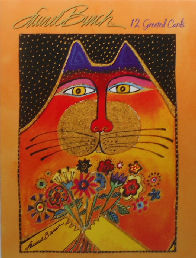 This folio of 12 Laurel Burch cat greeting cards includes 2 designed birthday cards, 1 designed thank you card and 1 designed card that sends "warm thoughts your way". There are 3 cards of each of the 4 designs. Matching designer envelopes included. Made in the USA.